Attention class! Come to order! Come on settle down! I know you’re excited to begin but we have a few basics to cover first! Ready? Got your needles? Yarn? Something to measure gauge? What’s gauge? Well, let’s get started! Chapter one covers the basics, from how to put together the perfect knitting kit, blocking and laundering, how to read a pattern and abbreviations. Then we get to practice these new techniques. Beginner’s Delights is the next section. From the very first “making a slip knot” to the basic cast on’s, and knit stitch. Binding off, weaving in ends, and even pom poms! Then we get to practice these new techniques. And someone’s going to win it! Leave me a comment telling me who or what you would use this book for! I can only do basic knitting (scarves, and jumpers that never fit as my technique is terrible) so I’d use this to improve and finally knit something pretty! I would use it to encourage some of the girls at a local youth club I help at to begin knitting and make gifts to put in shoeboxes for Operation Christmas Child. Oh AND to remind myself of some of the stuff I have no doubt forgotten. I would give this to my niece who is learning to knit. My sister does not knit so a book like this will be good. I read every knitting book I can get my hands on! I would like to learn beyond the basic techniques to be able to knit more advanced projects for myself and my family. This looks like a great reference for a somewhat new knitter like myself, I’d defiantly share it with my niece when she comes over to get her started knitting, she’s been asking when she’d be old enough. 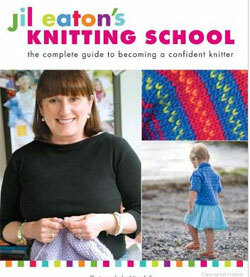 I am always looking for good books to teach knitting classes with. I wish I could learn to read my knitting better, so I wouldn’t get so lost when doing cables and lace. I get lost so often! This book would surely help me get past some of my knitting phobias and get further with my knitting! Would love the book for my daughter 🙂 She is just getting started and would enjoy a wonderful tutorial book. It’s my dream to one day retire and open a yarn store. I’d use the book to refine my techniques, better my knitting, and also to help me in my quest to become a master knitter. My niece is five and enjoys watching me knit. I’d love to be able to pass this book on to her in time. My husband and I just started a plan to get out of debt and one of the recommendations is to give crafts for xmas. That is what I would use this book for. It would definitely help me improve my knitting! I am a beginner and could definitely use a more solid foundation of the basics, as I tend to choose patterns beyond my knitting know-how…. just love a challenge, I guess! this book would be so helpful, as I am new at knitting and find myself in problems that I don’t even know how I got myself there! for me, my kid, and friends!